Position: Head of the Department of Science, International Cooperation and Control of Medical Services in the Feofaniya Clinical Hospital of the Ukrainian State Administration. 1989 M.D., Medical department, Ternopil State Medical Institute. 1994 M.D., Ph.D. in neurology, the Shupik Kyiv Academy of Postgraduate Education. 1999 M.D., D.Sc. in neurology, the Shupik Kyiv Academy of Postgraduate Education. 1997 1st place at the 1st International Medical Congress of Students and Young Scientists. Neurology, psychiatry and medical psychology section. Ternopil, Ukraine. 2004 Winner of the Ukrainian rating of professional achievements “Leader of Ukraine”, Kyiv, Ukraine. Lushchyk U.B., Alexeyeve T.S. WHY TODAY INDEXES OF MORBIDITY AND MORTALITY OF CARDIOVASCULAR PATHOLOGY DON’T DECREASE? Practical Angiology, N3 (32) 2010, с. 5-11. V.P. Boyun, U.B. Lushchyk, L.B. Malinovskyy, V.V. 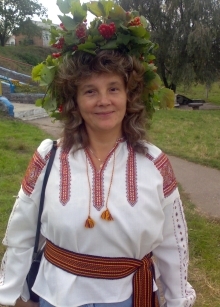 Novytskyy. HEMODYNAMIC LAB “MACROMICROPOTOK” FOR INTEGRATED EXAMINATION AND EFFICIENT CORRECTION OF THE HUMAN VASCULAR SYSTEM. “Science and Innovations” N 1, 2010, с. 45-58. Lushchyk U.B., Novytskyy V.V., Lushchyk N.G., Babiy I.P., Alexseyeva T.S. THE UP-TO-DATE POTENTIAL OF AN INTEGRATED FUNCTIONAL ESTIMATION OF THE ARTERIOVENOUS BALANCE IN THE CLOSED VASCULAR SYSTEM ON THE MACRO- AND MICROLEVEL, 2006. Lushchyk U.B., Novytskyy V.V. SOME ASPECTS OF THE APPLIED HEMODYNAMIC IN THE EPOCH OF THE INTRAVITAL VISUALISING TECHNOLOGIES, 2005. Lushchyk U.B., Novytskyy V.V., Kolosova J.A. UP-TO-DATE POTENTIAL OF CAPILLAROSCOPY, 2005. Lushchyk U.B., Novytskyy V.V., Alexeyeva T.S., Francevich K.A., Branytska N.S. ANALITICAL ASPECTS FOR THE INDIVIDUAL HEMODYNAMIC CORRECTION IN THE ANGIONEUROLOGY, 2003. Lushchyk U. B. THE “BLIND” DOPPLER FOR CLINICAL INTELLECTUALS (QUALITATIVE ASSESSMENT OF CEREBRAL DYSGEMIA), 2004. Lushchyk U.B., Novytskyy V.V., Tkachenko J.N., Reutman J.M., Moroz V.L., Kolosova J.A., Francevich K.A. COLOUR-CODING OF ULTRASOUND SCANNED IMAGES, 2003. Lushchyk U.B., Branytska N.S. INVESTIGATION OF THE ARTERIAL AND VENOUS BALANCE (APPLIED ASPECTS OF ULTRASOUND DOPPLEROGRAPHY), 2003. Lushchyk U.B., Lushchyk N.G., Babiy I.P. APALLIC SYNDROME, 2003. Lushchyk U.B. MEANING OF CHANGES IN THE ARTERIAL AND VENOUS BLOOD SUPPLY FOR THE BRAIN WHILE CHOSING VASOACTIVE MEDICINE FOR TREATING PEOPLE DIFFERENTLY AGED, 1999. Lushchyk U.B. FUNDAMENTALS OF TECHNIQUES OF CEREBROVASCULAR ULTRASOUND DIAGNOSTICS, 1997.